This recipe is simple. It’s just yogurt. In a bowl. 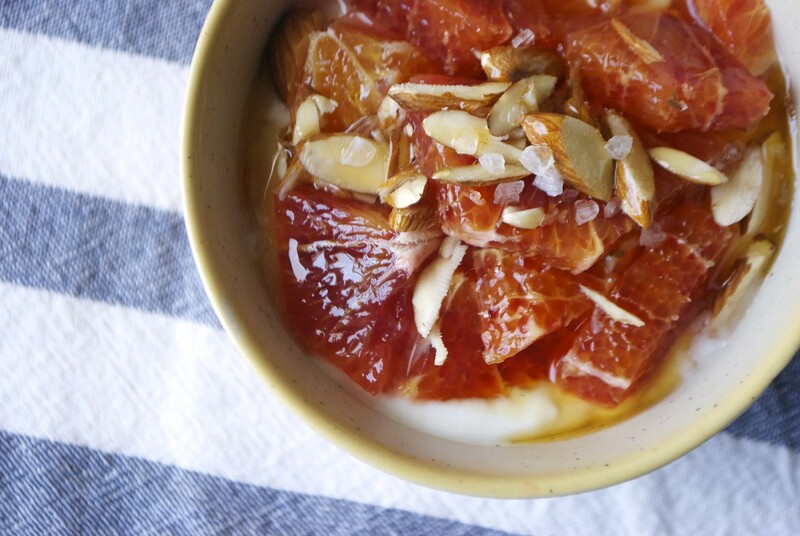 With blood oranges and honey. Are you having a good weekend? I hope you are. 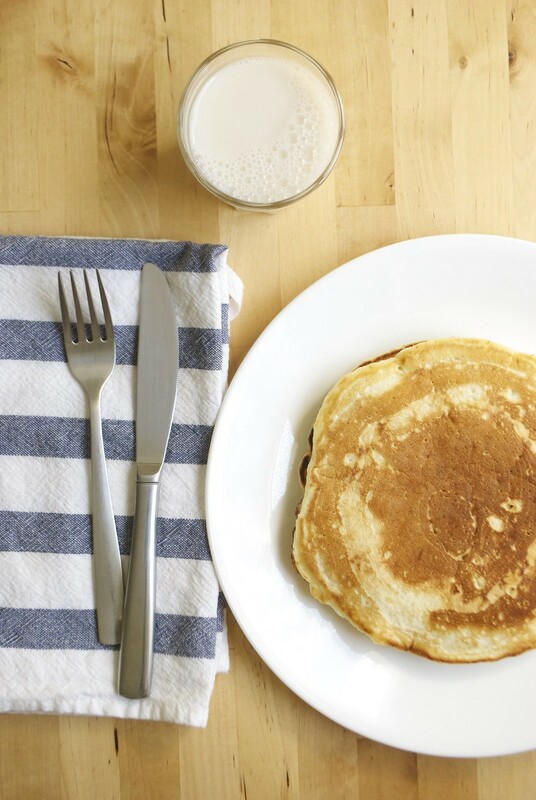 I hope you’re sleeping in late and making some very good pancakes. I write this sleep deprived, from an airport in Charlotte, North Carolina. I’m en route to my parents’ home in Florida, and have a three-hour layover. Yes, that’s right, three hours in an airport at 6 AM. I’ll take three hours over a rushed thirty minutes, but it’s still a long time. There are really only three things I like to do during layovers– nap, read things on the internet, and buy Cinnabons. While I can’t share my Cinnabons (or my naps, sorry!) here are the links that have been keeping me busy. Mark Bittman moves to Berkeley. Good move, Mark. Good move. Speaking of all things local, two very different city guides to Oakland. On point. My personal favorite brunch spot. The best bagels you’ve ever had. Desperate for a hike at Land’s End. This is what 7×7 thinks you should do in the Presidio. I was recently told I should hike here and eat here. I’ll take advice from the locals. I love hearing about the sometimes-incredible, sometimes-slightly-crazy things city dwellers do to experience the outdoors. The Joyous Wilderness of Urban Swimming. Thoughts of Cameras, Authenticity, and Euphoria. This is important. Cook Like a Pro. This is how you turn your home-cooked meal restaraunt-worthy. That, and you pay someone to do your dishes and bring your meal to the table for you. Currently reading: this + this. But pancakes shouldn’t be hard to pull off. You shouldn’t have to mix and measure and mix again, dirtying every dish in your kitchen. And you definitely shouldn’t have to spend Saturday morning with a plate of too-chewy, too-dense, too-icky-sweet pancakes. Especially not after all that effort. 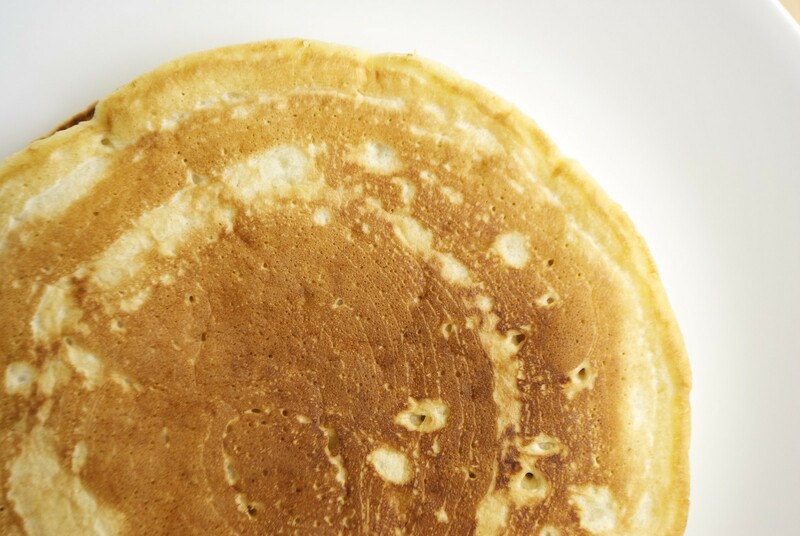 I’m a firm believer in pancake simplicity. I never envisioned this blog as a place for how-tos, but I’m liking these simple posts. Photographed step-by-steps of kitchen basics. This might turn into a series. I’ve shot a few of these posts so far. While I imagined them as a way to share my kitchen knowledge, I’ve actually learned a few new tricks myself. 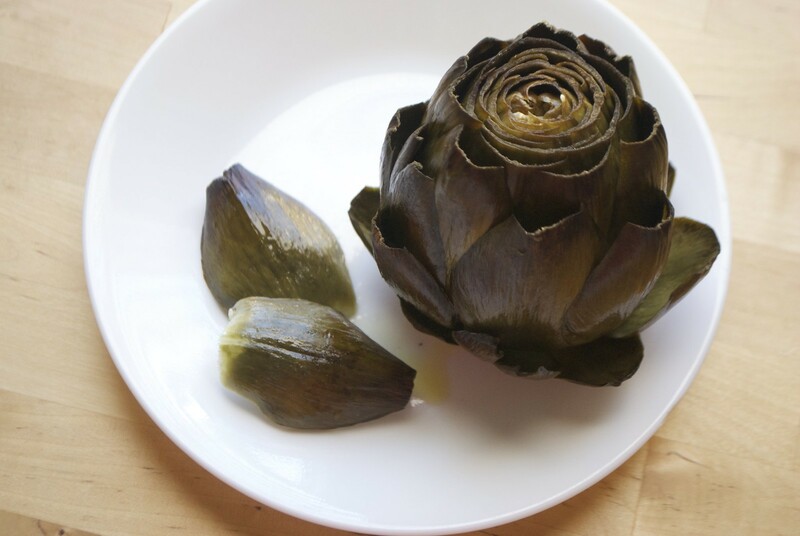 Take this post on artichokes, for example. I had never roasted them before testing out this recipe for the blog. It has been years since I had an artichoke— three, maybe four years. My parents used to steam them for family dinners every once in a while, but artichokes mostly looked intimidating to me. Sharp, spiky, messy to eat, and how on earth are you supposed to cook them without turning them mushy? 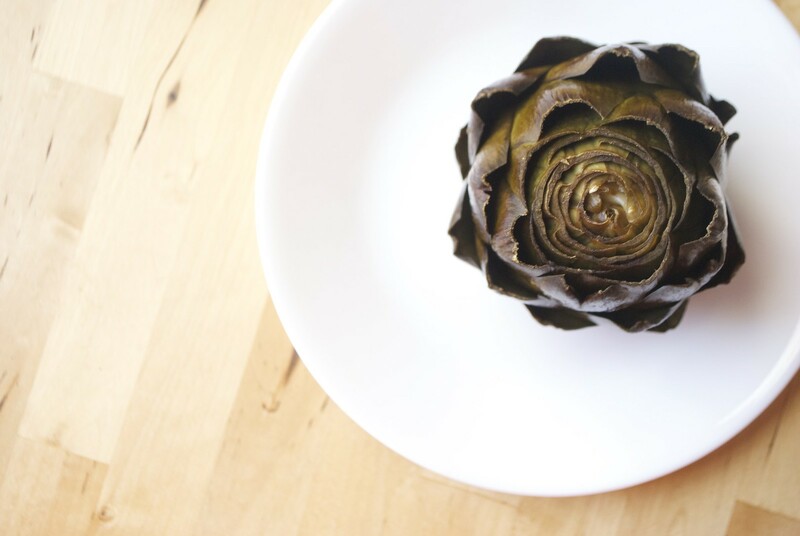 The flavor of an artichoke is incredible, but hardly ever seemed with the work. 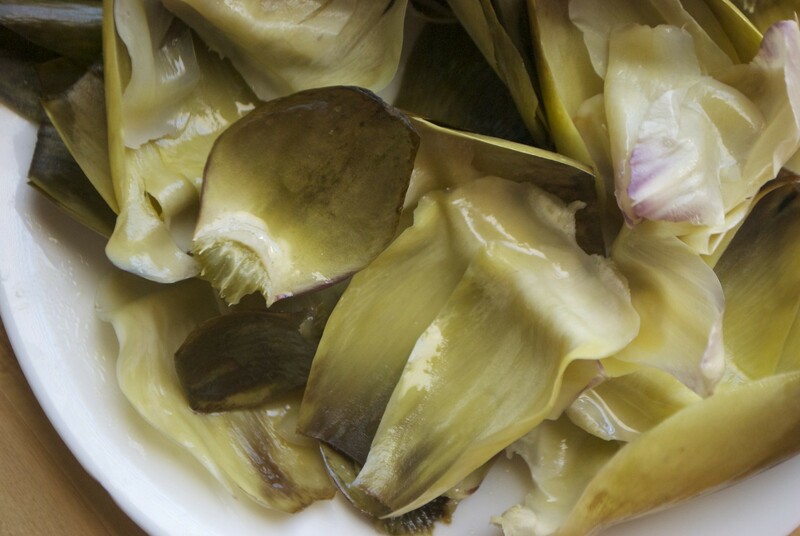 I’ve eaten steamed artichokes my whole life, which are easy enough to make. But I was recently told that grilled artichokes are the gold standard. I don’t own a grill, and I still haven’t had an artichoke with that special charcoal smokiness. But what I do have is a very hot oven. I bought a bunch of artichokes and opted to roast them, concentrating their flavor and adding just a touch of caramelization. It’s Sunday! I love a lazy Sunday, but my Sundays have been less than lazy lately. It’s no good. I’m totally reclaiming my weekend with a good brunch + coffee + quiet time. 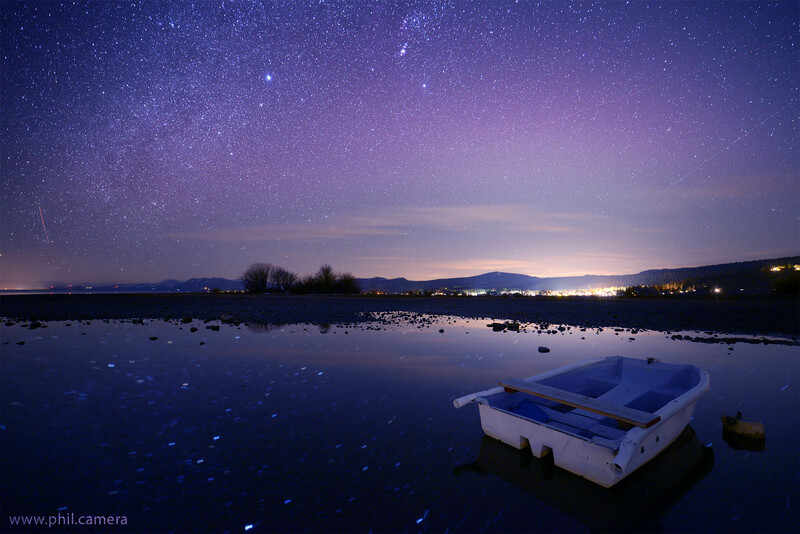 And this list of favorite links from around the internet. That’s really all I can say about this sandwich. Crispy, buttery goodness. Gooey filling. Delicious vegetal bitterness, first from the baby swiss cheese, then from the hand ground spinach-almond-olive oil pesto. And just the right amount of salt. This sandwich is not a health food. I recently caught myself saying to a friend, “Most of the things I cook are pretty healthy. Well, except for the stuff I make for the blog, of course.” And while I regretted for a moment that this blog wasn’t a space exclusively for healthy food— an instagram-perfect fruit salad or the kind of kale and quinoa dishes that are good for your heart— I quickly got over it. 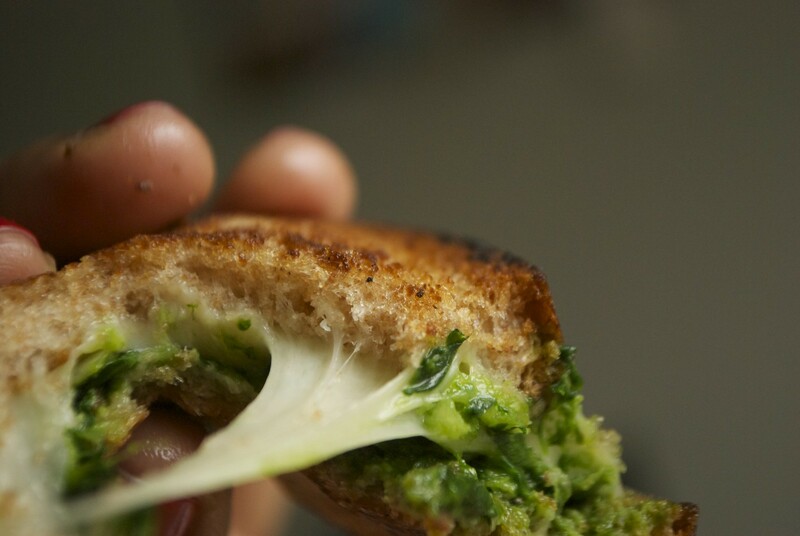 It’s ridiculous to believe that we can live off grilled cheese alone (impossible, I’ve tried it), and of course the healthier the food the better for our bodies. Ninety percent of my diet is not this. It’s mostly whole grains and veggies and proteins. But I also believe that food should also be celebrated— celebratory, lavish, extravagant, unapologetic, and just crazy at times. Not all the time. But sometimes. This sandwich begins with pesto, hand ground for one in a mortar and pestle. You could certainly double or triple the recipe and make it in a small food processor. You’d think that having a blog means writing about whatever, whenever. Truth is, I’m sitting here trying to write a blog post about cold weather St. Patrick’s day food when all I want to talk about is warm weather recipes. Pressed juices! Grain salads! Popsicles! A million glasses of lemonade! But we’re keeping it together. At least for a couple more weeks. 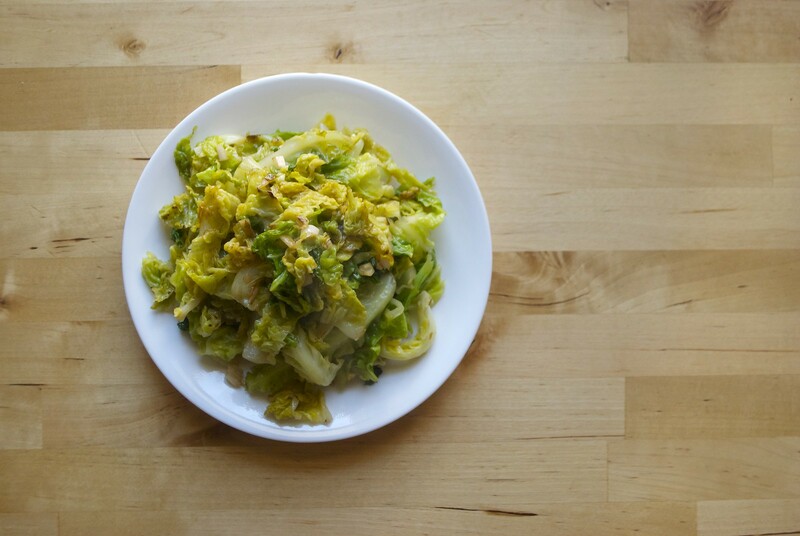 As far as winter veggies go, cabbage is pretty darn good. 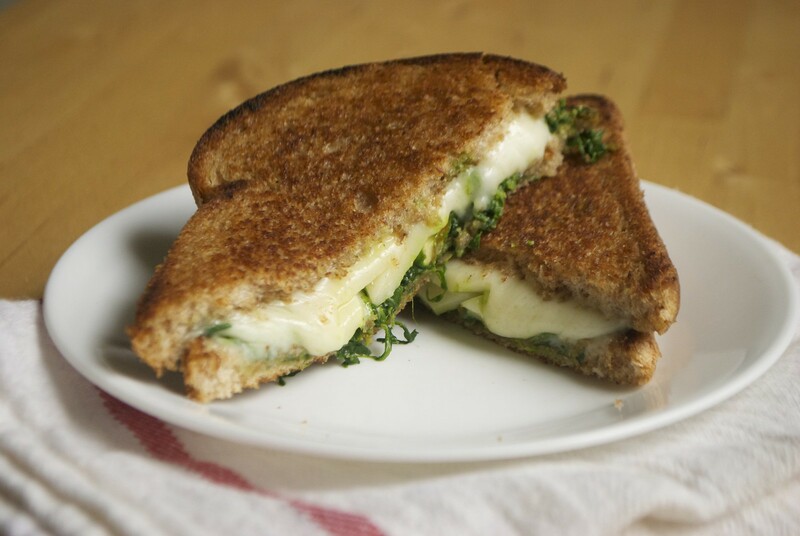 Lovely spring green, crinkled leaves, a lot of crunch, and buttery tenderness when cooked. I recently had crunchy raw cabbage with the best ever aioli at a Japanese restaurant. Heaven. Why we’re relegated cabbage to the “unlovable” category is beyond me. Everyone loves brussels sprouts, kale, even lowly chard. 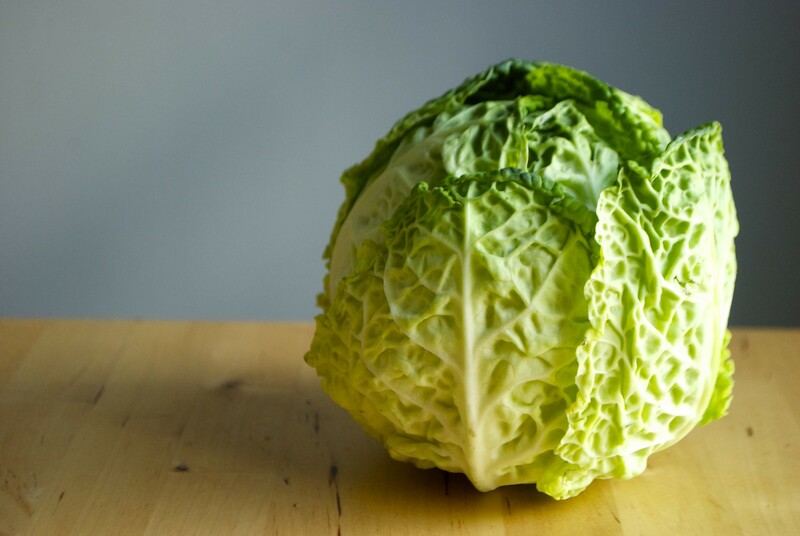 But I’m yet to hear from someone that they just love cabbage.